Apple's MagSafe 2 power adapter, which was introduced alongside the Retina MacBook Pro in 2012, reincorporates the T-shaped connector design that was previously abandoned for an "L" style MagSafe connector due to issues with the strain that the "T" style connector placed on the power adapter cable. To combat cable strain with the T-shaped MagSafe 2, Apple designed the connector to pull away from the MacBook when even slight amounts of pressure are applied to the cable, resulting in frequent and unintentional cable disconnections. The Snuglet, a newly introduced Kickstarter project, aims to keep MagSafe 2 power adapter cables securely fastened to MacBooks by incorporating a small ring that increases the connector's magnetic connection. If you leave anything near the power cable, you'll often find that your Mac isn't charging. This is especially frustrating when leaving on a trip or going to a last-minute meeting, only to find that your battery is empty. The Snuglet is described as a gold-plated "precision manufactured ring" that attaches directly to the MagSafe 2 connector. It does not interfere with the insertion or removal of the power cable, but it does ensure that the cable remains more firmly attached to the MacBook. While the Snuglet is meant to remain attached to a MagSafe 2 connector, it can be removed using a special tool included with the package, which means it is fully reusable. It is also designed to work in conjunction with the MagSafe to MagSafe 2 Converter. There are a limited number of slots allowing interested backers to secure a set of Snuglets for $12, with additional price points available at $15 and $19. The product has an estimated ship date of September 2013. Looks like he missed the point of MagSafe. It's supposed to disconnect!! 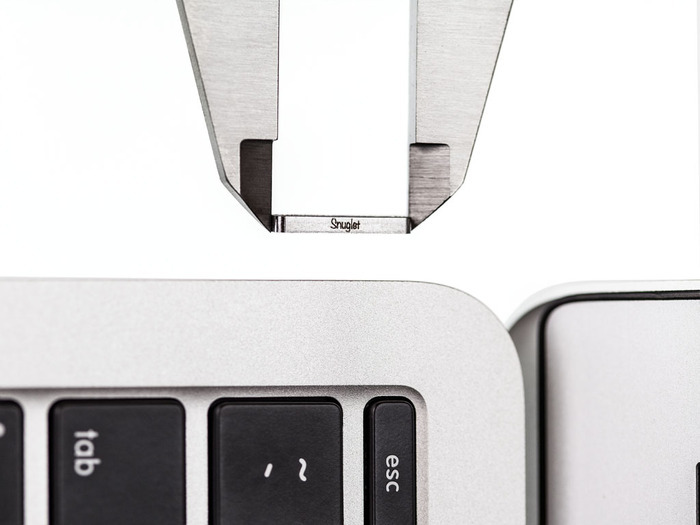 With this 'snuglet' fitted, your MacBook will be ripped off your table when you trip over a cable. Also, when using your macbook on your lap, you don't rest the MagSafe on your leg, you rest the laptop on your leg, so that video is complete rubbish. Interesting how many people can find solutions for problems that don't exist, and band-aids for problems that stem from improper use. I have here a MagSafe 1 adaptor from the original MacBook Pro that has never had a problem - I just make sure that anyone using it uses it properly. Problem solved. It gets used almost every day, connected/disconnected several times a day by many different people over the years. I also have a MagSafe 2 equipped 13" Retina. I have never noticed a propensity to disconnect unexpectedly. If I'm putting force on it, I expect it to disconnect - adjust workflow/workspace appropriately. Almost looks as if it's too secure (example being when the person pulls it across the bed). I'd be concerned that the magsafe connector would no longer be doing its job. The first portion of this video, where all those sad Magsafe connectors are coming loose at the slightest hint of movement, just reminds me of the WaxVac commercial where the guy so innocently cleaning his ears and suddenly...OW! IT'S A DEATH TRAP! All I'm saying is, this has never been a major problem for me and, like inadvertantly and severly puncturing my eardrum with a Q-tip, I was not aware that this was that big of an issue. Also, this product is dangerous. It has the possibility of getting stuck in the power port and causing havoc, not to mention a choking hazard. Also has the possibility of generating sparks upon disconnecting. Lol. Did you get all that from the video? I wouldn't call the product getting stuck in the port "causing havoc"' especially when they supply a tool to remove it. I have an L connector on my 2011 MBP...and I really like that it goes back instead of sideways. The thingy advertised looks to me like it makes too tight a connection, defeating the purpose of the breakaway MagSafe. What's funny is in all my years using MacBooks, I've never been in a situation where I could say "thank goodness MagSafe saved my Mac". I like it more for the ability to easily attach to my Mac for charging. I find the detachability to be an annoyance. Since I define the word "klutz", I have kicked the MagSafe connector out on 3 or 4 occasions, and was very happy that it just broke away as it should. I could easily have damaged the cable connector or worse, damaged the power connector in the computer. Actually, no I've never had that happen. MagSafe has IMO just the right amount of "grab vs give". I'm sorry, but it seems like most of these Apple-related kick starter projects are solutions in search of problems.